Your gifts are uniquely yours, and who you truly are behind the various masks isn’t determined by your parents, or your teachers, or your friends. It’s not up to other people who you are. At the same time, you are called to manifest yourself in a social context – to bring your gifts to the benefit of others. Maybe nonhuman animals do know who they are. Maybe they even know it better than we humans do. 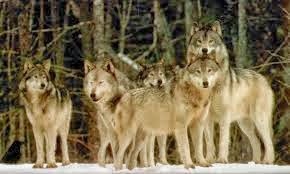 Wolves, for instance, like our primate ancestors, evolved to live in packs. Yes, there is the occasional lone wolf, but a wolf is at a severe survival disadvantage without its pack. A single wolf doesn’t have all the gifts to survive. Eventually, lone wolves die or rejoin a pack. Individual wolves bring different gifts to the pack. There is an alpha pair. These are the ones who produce puppies and lead the pack, but not always. Any motivated wolf can lead, and pack activity can be based on the impulses of several pack members. The lead wolves depend on what other pack members are doing, the varying gifts of their packmates. While one wolf may lead an attack to defend its territory or protect the pups, other wolves will pull back off a useless fight with bears. Instead of judging them cowardly, let’s say evolution needed a wolfpack's members to exhibit a range of attack readiness vs. prudent withdrawal. Other wolves have exceptional senses of smell to find the prey, but are not swift of foot. Others are swift and can bring down prey but may never be the ones to produce young. You see, gifts in social animals were not meant to work alone, but in a complex array that ensures pack survival. Typically one pair has the pups, and the whole pack helps raise them. Each is father, mother, and parent, bringing what gifts they can to increase the chances the young will flourish. By keeping the young alive, the pack preserves the species. By preserving the species, the pack preserves the health of a whole ecosystem. This is what we are here to do – use our gifts for ourselves, our community, and the earth. Then we know who we are. Then we become who we are. And though we don’t choose our gifts (they choose us), what we can choose is to bring out who we are to bless the world. Bring it forth and choose to bless the world. This is part 5 of 5 of "Vocation: Who Are You?" Previous: Part 4: "Joining Self and Service"